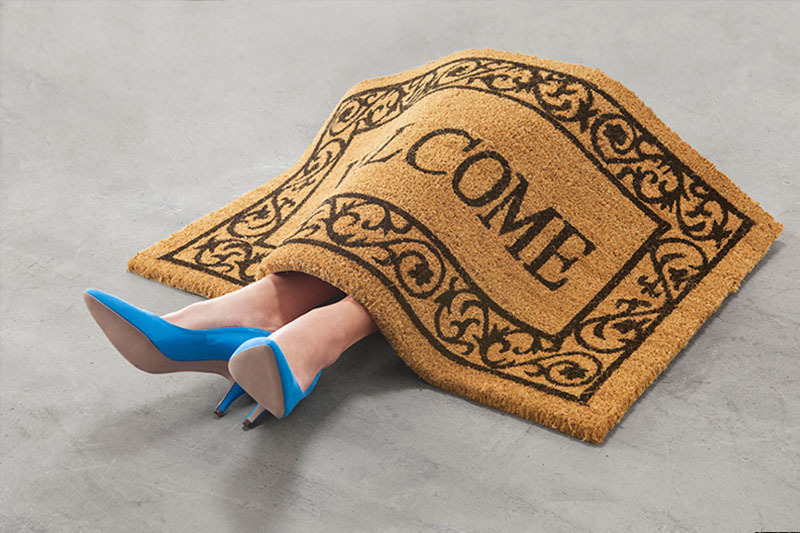 You are here: Home / divorce / Tired of Being Treated Like a Doormat? It happens all the time and you’re probably not even aware of it. Or you are aware of it, but you’ve just accepted it as a way of life. Your boss just *assumes* you’re going to work late…even though you already made plans. Your ex texts you, saying how sad he is, although you asked him to quit contacting you. Your adult daughter hangs up on you when she gets a call from a friend. At this point in your life, after your divorce and as you work to move on, you may have just shrugged it off, accepting the fact that people are going to walk all over you, treat you like a doormat, and there’s nothing you can do about it. Are you tired of being treated like a doormat? So, if you’re tired of being treated like a doormat. I’m going to show you how to easily stand up for yourself and show people how to treat you with the respect you deserve. But first, we gotta talk about some ugly truths. They’re hard to read, but you need to know them. Ugly Truth #1. Many of us were conditioned to be “nice” and to not make a scene. Many times in childhood, adolescence, and adulthood you were taught to play nice, to be “well-behaved, and to not make a big deal out of something, society was conditioning you to be okay with not having your voice heard. You were being conditioned, little by little, to accept the fact that people could walk all over you and take advantage of you. And you were being conditioned to think it was socially unacceptable or “bad” to voice your opinion that something was wrong, or if you didn’t like something. And that being “nice” and being “the good girl” meant that you had your voice taken from you. Ugly Truth #2. Many of us were not raised to establish strong boundaries. A result of being raised to be “nice” and not make a scene meant that plenty of people—whether it was your ex, your family, your kids, your friends, your coworkers–probably asked too much of you, intruded in personal business, or took advantage of you. And since you were never given the tools to say, “No,” or “I’m not comfortable with that decision,” you may not have learned how to establish strong boundaries for yourself. It was like the concept never even existed. Ugly Truth #3. We were taught by society that our needs didn’t matter. This probably happened to you as well—whenever you voiced that something wasn’t fair, or if you got angry that you didn’t get what you wanted. But that constant failure to acknowledge the things you wanted, even when you were little, conditioned you to think that what you wanted—even what you needed–was never a priority. Which is why so many of us have a hard time advocated for ourselves. And then we blame ourselves for not knowing how to do it. And it usually takes some life-shattering event like a divorce to wake us up. But think of that divorce as a blessing in disguise, because now you’re presented with an opportunity to find your voice, and reverse course on the disrespect. I want you to take everything you’ve been taught about “not making a scene” and “being nice so that people don’t think you’re a witch…” and throw in in the trash. Because your newest challenge is here. Ask yourself: Is doing this thing something I’m comfortable with? Is it something that inconveniences me? Ask yourself: What’s in it for me? If there’s nothing in it for you, don’t do it. Remind yourself that your needs matter, too. Communicate your expectations moving forward. As a heads-up, the people who treat you like a doormat may push back a little when you stand up for yourself. They may call you selfish, or whine and “what’s wrong with you? Why are you acting like this?” When this reaction happens, remember, this negativity has nothing to do with you. This reaction is the manifestation of the fact that they cannot handle your new strength. You deserve better. You deserve to have your voice heard. You deserve to have your needs communicated. Your voice matters. You matter. And don’t let anybody try to convince you otherwise. So, today, what steps will you take to find your voice and communicate that you will no longer be treated like a doormat? The post Tired of Being Treated Like a Doormat? appeared first on Divorced Moms. Family Injustice: What’s in the "best interest" of Texas kids. http://family-court-corruption.com/wp-content/uploads/2019/01/Tired-of-Being-Treated-Like-a-Doormat.jpg 533 800 admin http://family-court-corruption.com/wp-content/uploads/2018/06/800px_COLOURBOX7350498-300x151.jpg admin2019-01-28 15:12:272019-01-28 15:12:27Tired of Being Treated Like a Doormat?